This past week, Grassroots Unwired traveled out to Happy Valley, PA for an opportunity to attend the 2018 Collaborative Conference: Inclusion by Design 2.0. 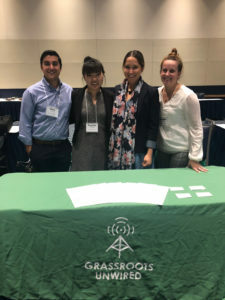 The conference was organized by the Alliance for Nonprofit Resources (ANR), the Community Action Association of Pennsylvania (CAAP), and the Pennsylvania Association of Nonprofit Organizations (PANO). In attendance were almost 300 leaders at nonprofit organizations from across the state, as well as a few groups that support their work (like us!). We appreciated learning from these incredible Pennsylvania community leaders whether in workshops or in smaller conversations. For me personally as a new Philadelphia resident, I was excited to hear about nonprofits’ impact within the community. A common theme of several workshops was finding creative ways to engage with community members, from more effective outreach through technology to creative partnerships with unlikely organizations. I was thankful that this added to my understanding of how I personally as well as within this team could better promote the empowerment of nonprofit missions through the use of innovative technology.